SeaDreams has just undergone a massive interior makeover which includes the addition of a modern kitchen, new high-end appliances, breakfast bar, private bar area, and entertainment center. It's the same view and location you know and love, with all the conveniences you expect, so you can enjoy your dream vacation in paradise. 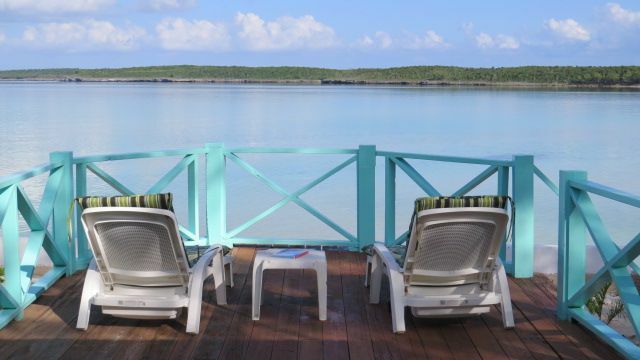 I also rent a 2 bedroom home that can sleep up to 6 guests in Winding Bay, Eleuthera, Bahamas on the Atlantic side of the island. If you prefer a larger beachfront home in a more southern location then please view my other listing homeaway vacation-rental p3736122. Jessica and I live on the North Carolina coast. She's the city girl and I'm the country field mouse. I'm an avid scuba diver and golfer, and she's the consummate traveler, cook, and voracious reader. Her roots go back to Sevilla in Spain while I've lived in NY/NJ most of my life. I'm the author of The Beach Books (Eleuthera, Curacao, Tortola), The Eleuthera Beach Map, and the Eleuthera Travel Guide. This was the second home I tried to buy in Eleuthera. I fell in love with the island on my first visit. After failing in negotiations for a place in Eleuthera Island Shores I was lucky enough to come across an ad for this place in the back of Islands magazine. The rest is history. I've since opened up my own vacation rental business, which I operate in my spare time, and recently completed publishing my fourth book on the beaches. The Eleuthera Beach Book has made the #1 Best Selling Bahamian Travel Guide list. Most of our guests love the vibrant color of the water evident from every room of the house and on the huge deck. They also say that they didn't realize how close the house was to the water (about 30 feet) from the pictures. I've always been partial to the wide open feeling of the cathedral ceilings coupled with its location. Great swimming, kayaking, snorkeling, beaching, and caving all without having to get in a car. The 1/2 mile long Ten Bay Beach is about 30 yards away. Right next to Ten Bay Beach on Caribbean side. Wade off of back steps. Cell (long distance) and land line (free local calls). Central air upgraded (new May 2014). 2 ton unit for living areas. Separate 1 ton unit for bedroom. New sheets and pillows May 2018. Aliv high speed wifi plus Batelco DSL backup service. New cotton towels and beach towels May 2018. 4 person breakfast bar and 4 seat dining table. CD player and iPod dock. The Beach Book, Eleuthera, Bahamas edition is available for guest use as well as a selection of other novels. Added more movies and TV shows May 2013. Netflix account provided. Lovely crotins, flowering hibiscus, and bougainvillea plus a Poinciana tree, coconut palms, and various other palms trees and cactus. Planted avocada, soursop, mango, and pineapple 2015. Sun and shade on main deck. Tropical shaded tiki hut by water's edge. Really enjoyed the cottage. Great open space with terrific view. All of the amenities were provided as advertised. The beach was beautiful and quiet.